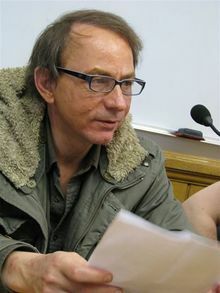 Michel Houellebecq (French: [miʃɛl wɛlbɛk]; born Michel Thomas; 26 February 1956) is a French author, filmmaker, and poet. His first book was a biographical essay on the horror writer H. P. Lovecraft. Houellebecq published his first novel, Whatever, in 1994. His next novels Atomised, published in 1998, and Platform followed in 2001 were also his best known works. ↑ Houellebecq was born in 1956, but gave out his birth year to be 1958, before it was revealed by a journalist. Flower, Jon (2013). Historical Dictionary of French Literature. Scarecrow Press. p. 246. Riding, Alan (September 10, 2005). "The French Still Obsess Over Their Gloomy Novelist of Despair". The New York Times. This page was last changed on 4 December 2018, at 00:08.